Booth Wrap® 4X HighTemp Protection Kit is used for baking booths up to 250°F metal temperature to High temperature—is a transparent protection film that has four layers. It easily keeps your Booth clean without water, The light tack adhesive backing prevents dust from accumulating behind the plastic, yet is easily removed without adhesive transferring to the sidewalls. Our system uses 2 inch wide tape around all edges of the applied film. 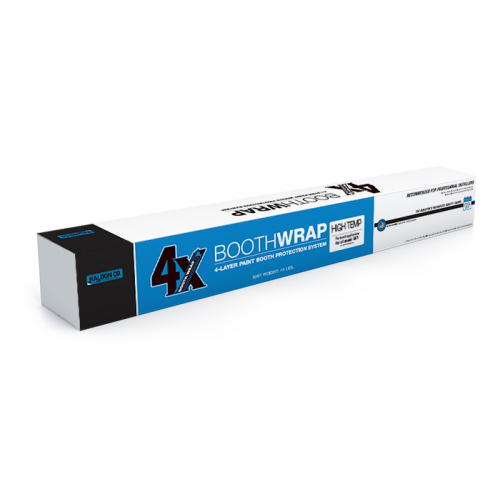 Booth Wrap 4X offers up to a full year of protection and is easy to apply with the dispenser and applicator. Developed for and by professionals.